Smith is a three-time Grammy Award winner, an American Music Award recipient, and has earned 45 Dove Awards. In 1999, ASCAP awarded him with the "Golden Note" Award for lifetime achievement in songwriting, and in 2014 they honored him as the "cornerstone of Christian music" for his significant influence on the genre. He also has recorded 31 No. 1 Hit songs, fourteen gold albums, and five platinum albums. He has also starred in two films and published 14 books including This Is Your Time, which he worked with Christian author Gary Thomas to write. I really started losing touch when I moved to Nashville, around April of '78. I was smokin' marijuana, drinking, doing some other drugs; just being crazy, you know. My mom and dad knew what I was doing. But they never hassled me; they just prayed for me. And I felt convicted by God. Every time I'd wake up I knew: This isn't me. But I couldn't change myself. In November 1979, Smith suffered a breakdown that led to his recommitment to Christianity. The next day he auditioned for a new contemporary Christian music (CCM) group, Higher Ground, as a keyboardist and got the job. His lead vocals were heard on much of CCM radio with the single, "I Am". It was on his first tour with Higher Ground, playing mostly in churches, that Smith was finally able to put the drugs and alcohol behind him. After the release of his 1988 effort, i 2 (EYE), Smith once again collaborated with Grant for her "Lead Me On" world tour. The following year, Smith recorded his first Christmas album, simply titled Christmas (1989). In 1990, Smith released Go West Young Man, his first mainstream effort, which included the mainstream crossover hit single "Place in This World". The song peaked at No. 6 on the Billboard Hot 100. In 1992, he released Change Your World, which included the No. 1 adult contemporary hit "I Will Be Here for You". In 1993 Smith released his first box set, The Wonder Years and his first greatest hits album, The First Decade (1983–1993). The latter also includes two new songs, "Do You Dream of Me?" and "Kentucky Rose". In 1994, Smith appeared as a guest pianist on the album Swing, Swang, Swung by Christian rock band Guardian. Nearly all of Smith's albums include at least one instrumental track, and in 2000, Smith recorded his first all instrumental album, Freedom. The following year, Smith released his first all-worship music album, Worship, on September 11. This album was followed by a sequel, Worship Again in 2002. Both albums were recorded live in concert. Worship Again also includes a song that Smith wrote called "There She Stands", inspired by the September 11, 2001 attacks. He performed this song live for the 2004 Republican National Convention, saying that President George W. Bush, who he said is a fan and a family friend, had asked him to write a song about the attacks. Smith won the Male Vocalist of the Year award at the GMA Music Awards in 2003. The same year he also released his second greatest hits album, The Second Decade (1993–2003), which includes a new single called "Signs". Smith's album, Healing Rain, was released in 2004 and debuted at No. 11 on the Billboard Hot 200 Chart. The title track rose to No. 1 on the Radio & Records Charts and a music video for the song was released. The album combines the pop style of his previous recordings with the religious feel of his two live worship albums. It was also nominated for a Grammy Award for Best Pop/Contemporary Gospel Album. In 2006 he released Stand, which is similar to Healing Rain (2004) in style and genre but with more Christian-themed songs. Also in 2006, Smith did the score and soundtrack to the film The Second Chance, which he also starred in. He also released a single from the soundtrack album, "All in the Serve". In October 2007, he released his third Christmas album, It's a Wonderful Christmas. On June 20, 2008, Smith recorded his third live Worship album at the Lakewood Church in Houston, Texas, titled A New Hallelujah. It was released in October 2008. That same month he began a tour with Steven Curtis Chapman. In September 2010, he released Wonder, which follows the CCM style of Healing Rain (2004) and Stand (2006). Smith's concert in Draper, Utah, on July 24, 2012 was almost canceled due to a complaint filed by a Utah resident on July 16, 2012. He claimed that a show "conflated with prayer and worship" should remain in church or private property, not in the "public's backyard". The following day the city council decided to cancel the concert, but a day later they decided to host the show as planned after all, following a criticism from a Utah evangelical group that equated cancelling the concert to an assault on religious liberty. The Mayor of Draper and several city council members were present at the event and were recognized for their support. In 2014, Smith released three albums, Hymns, Sovereign, and The Spirit of Christmas. Hymns is Smith's first effort at doing his own rendition of traditional hymns, and it was released exclusively at Cracker Barrel Old Country Store on March 24, 2014. The album sold 12,000 copies in its first week of release and debuted at No. 24 on the US Billboard 200. It was also the best-selling Christian music album for the week of April 19, 2014, and won a 2014 Dove Award for "Inspirational Album of the Year". Sovereign, released on May 13, 2014, is his first studio worship album and his first album released through Capitol Records, after leaving his long-time label Reunion Records in 2013. The album sold almost 16,000 copies in its first week, and debuted at No. 10 on the Billboard 200, making it the highest charting album in his career as of 2014. The Spirit of Christmas, officially released as Michael W. Smith & Friends: The Spirit of Christmas, is Smith's first duet album. Released on September 30, 2014, it features duets with Carrie Underwood, Lady Antebellum, Little Big Town, Jennifer Nettles, Martina McBride, Vince Gill, Bono, Amy Grant, and Michael McDonald. The album marks Smith's third new album in 2014 to enter the Billboard 200, peaking at No. 16 as of December 2014[update]. It also won a 2015 Dove Award for "Christmas Album of the Year". 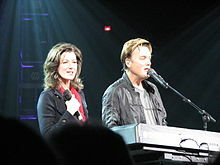 Smith, along with Amy Grant, was honored as the "cornerstone of Christian music" by ASCAP in 2014 for his significant influence on the genre. In 2015, Smith and his son Tyler wrote the score and soundtrack for the film 90 Minutes in Heaven, which he also has a small acting role in. In November 2015, Smith and Amy Grant started their annual Christmas tour again after a roughly 15-year break. Smith's second hymns album, called Hymns II - Shine on Us, was released on January 29, 2016. Like his first hymns album released in 2014, the album was sold exclusively at Cracker Barrel Old Country Store. On June 21, 2016, Smith released a new single titled "He Will Never End" which was originally released in March 2016 as a bonus track on the Target exclusive edition of The Passion: New Orleans soundtrack CD (2016). On June 27, 2016, he released the music video for the single which was filmed entirely in Israel in April 2016. Later in 2016, Smith released a Christmas musical project in a collaboration with Wes King, Bradley Knight, and Luke Gambill called Almost There – A Christmas Musical. The musical is named after a song Smith wrote a few years ago for his Christmas album The Spirit of Christmas (2014). On August 11, 2017, Smith released a new single, "A Million Lights", which marks a departure from his previous sound. It is the lead single and title track from his pop album released on February 16, 2018. A week after, on February 23, 2018, Smith released another album called Surrounded which is his first live worship album in ten years. The two albums became his 30th and 31st top 10 entries in Billboard's Top Christian Albums chart, the most among solo artists in the span of his career. In May 2018, Smith launched a new children's book series, Nurturing Steps, which he created with VeggieTales co-creator Mike Nawrocki. The first book, Nighty Night and Good Night, was released May 8. He also released his first children's album, Lullaby, to accompany the book. On August 30, 2018, Smith hosted a free event at Nashville's Bridgestone Arena called "Surrounded: A Night to Pray, Worship and Be Awakened". The event will be broadcast on TBN later this year in 175 countries worldwide. On February 22, 2019, Smith released Awaken: The Surrounded Experience, a live worship album. Smith also starred as James the disciple in The Passion, a live musical film that was aired on FOX on March 20, 2016. In 1994, Smith opened a teen club, named Rocketown, in Nashville, Tennessee (6th Avenue). Later in early 2003, the club was moved to a new location—a renovated warehouse in downtown Nashville. The venue offers a large dance floor, extensive indoor skate park, and a café hosting live acoustic music. In 1996, Smith opened his own record label, Rocketown Records. The label was named after a song on his third album The Big Picture. The first artist signed was Chris Rice, who had written "Go Light Your World", a No. 1 hit song by Kathy Troccoli, in 1995. Smith didn't record under the label himself until 2018. Smith was active in Billy Graham Crusades as well as Samaritan's Purse. Smith sang "Just As I Am" in a tribute to Graham at the 44th GMA Dove Awards. He also sang it at the memorial service honoring Graham at the United States Capitol rotunda on February 28, 2018. Smith is married to Deborah "Debbie" Kay Davis (b. 1958) and has five children: Ryan, Whitney Katherine Mooring (married to Jack Mooring of the band Leeland), Tyler Michael (keyboard player for the United Tour), Anna Elizabeth, and Emily Allison. He resides in the Nashville suburbs and spends time at his farm. Smith attended Belmont Church in Nashville, Tennessee and is mentored by its long-time pastor, Don Finto. Smith is also the founding pastor of New River Fellowship church in Franklin, Tennessee, where he was the lead pastor from 2006 to 2008. Smith and his wife remain involved members of the church. Smith was a personal friend of former President George H. W. Bush and is a friend of his son, former President George W. Bush. Smith was invited to play at the 2004 Republican National Convention singing "There She Stands", as well as the state funeral of George H. W. Bush at the National Cathedral in Washington, DC, on December 5, 2018, singing "Friends". Smith is also friends with U2 singer Bono and they have collaborated on a Christmas album as well as the ONE Campaign. Smith was also named one of People magazine's "Most Beautiful People" in 1992. In 2018, he sang and played piano at Billy Graham's memorial and funeral. The Gospels Come to Life. Irving, Texas: Gospels Come to Life, 2003. 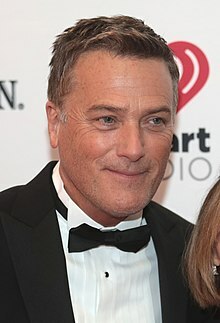 1989 Best Gospel Vocal Performance, Male for "Holy, Holy, Holy"
2009 Inspirational Recorded Song of the Year for "A New Hallelujah"
^ a b "Michael W. Smith, Christian Music Icon, Leaving Provident For Capitol Christian". Billboard. July 18, 2013. Retrieved October 6, 2014. ^ Strombitski, Mary Ann; Matt Williams (January 31, 2003). "Michael W. Smith Helps Compassion Gain Nearly 4,000 Sponsorships". Compassion International. Archived from the original on February 10, 2007. Retrieved August 15, 2009. ^ a b "Smith in SA in May". News24.com. April 30, 2015. Retrieved May 1, 2015. ^ "'Inspiring' Smith set for Spirit Jam", Corpus Christi Caller Times, August 1, 2008. ^ "Lecrae, Lauren Daigle and Seth Mosely Win Big at Dove Awards". Billboard. October 14, 2015. Retrieved October 14, 2015. ^ a b Smith, Barbara (1999). Cooking with Smitty's Mom. Thomas Nelson Publishers. p. 46. ISBN 978-0-7852-6918-2. ^ a b "ASCAP Christian Music Awards". ascap.com. May 6, 2014. Retrieved February 18, 2015. ^ Smith, Michael (1999). This is your time. ^ a b Sandra Brennan. "Michael W. Smith: Biography". AllMusic. Retrieved August 15, 2009. ^ a b c d e Long, Jim (March 1988). "Michael W. Smith Looks Back". Christianity Today. 46 (8): 56. ^ Smith, Michael W. (2003). It's Time To Be Bold. Thomas Nelson. ^ Croteau, Roberta (December 2004). "Ready for His Close-up". CCM Magazine. Retrieved August 15, 2009. ^ Woodland, Shannon. "Mr. Smith Goes to Washington". CBN Music. Retrieved November 10, 2011. ^ "GMA Dove Awards Male Vocalist of the Year History". About.com. Archived from the original on February 19, 2012. Retrieved November 10, 2011. ^ Michael W. Smith Reveals the "Wonder" of God's Grace: Review, CBN.com. ^ "Glory". CD Universe. Retrieved December 10, 2011. ^ "Christian concert in Draper on again despite lawsuit threat". The Salt Lake Tribune. Retrieved July 22, 2012. ^ "Michael W. Smith Announces Exclusive "Hymns" Release at Cracker Barrel". NewReleaseTuesday.com. March 8, 2014. Retrieved March 14, 2014. ^ Caulfield, Keith (April 4, 2014). "Chart Moves: 'God's Not Dead' Sales Surge, London Grammar Gains, Karmin's Full-Length Arrives". Billboard. Retrieved April 7, 2014. ^ "Christian Albums (link shows current list and at the bottom there's an archive for every week back to year 2000)". Retrieved September 28, 2014. ^ "Dove Awards 2014 Winners: Pre-Show Awards Given Out to Switchfoot, Skillet, Michael W. Smith, and More". BREATHEcast. October 7, 2014. Retrieved November 4, 2014. ^ Papadatos, Markos (March 14, 2014). "Interview with Michael W. Smith: 'You Won't Let Go'". Digital Journal. Retrieved March 14, 2014. ^ a b Caulfield, Keith (May 21, 2014). "The Black Keys Earn First No. 1 Album, Michael Jackson Debuts at No. 2". Billboard. Retrieved May 23, 2014. ^ Horton, Carrie (August 24, 2014). "Michael W. Smith Announces Christmas Album with Lots of Country Stars". Taste of Country. Retrieved September 16, 2014. ^ Stephens, Samantha (August 19, 2014). "Carrie Underwood, Lady A Get Festive With Michael W. Smith". CMT. Retrieved September 16, 2014. ^ Caulfield, Keith (October 12, 2014). "Billboard 200 Chart Moves: Herb Alpert Returns After 27-Year Absence". Billboard. Retrieved October 10, 2014. ^ "Michael W. Smith - Chart History". Billboard. Retrieved November 25, 2014. ^ "Amy Grant reflects on Christmas traditions and keeping family close in advance of Hershey show with Michael W. Smith". lancasteronline.com. December 10, 2017. Retrieved January 12, 2018. ^ "Cracker Barrel Old Country Store® Partners with Michael W. Smith to Sponsor Nationwide Christmas Tour". businesswire.com. December 2, 2015. Retrieved December 2, 2015. ^ "The Passion: New Orleans, Soundtrack arrives March 18. Target version of the album features a brand new Michael W. Smith song inspired by the Passion!". michaelwsmith.com. Retrieved July 15, 2016. ^ "Michael W. Smith "He Will Never End" Music Video". thechristianbeat.org. June 27, 2016. Retrieved July 15, 2016. ^ "Almost There – A Christmas Musical – Now Available for Church Worship/Choir Directors… (Listen to the musical here)". michaelwsmith.com. Retrieved November 22, 2016. ^ "Almost There Arrangers: Michael W. Smith, Wes King, Bradley Knight, Luke Gambill". Brentwood Benson. Retrieved November 22, 2016. ^ "Michael W. Smith Releases 'A Million Lights' Single Today". newreleasetoday.com. NewReleaseToday. August 11, 2017. Retrieved October 27, 2017. ^ Ryan, Patrick (October 24, 2017). "Michael W. Smith is lost in space in 'A Million Lights' video". USA Today. Retrieved October 27, 2017. ^ "Two For February: Second album by Michael W Smith to be released in February". Cross Rhythms. January 2, 2018. Retrieved January 12, 2018. ^ Asker, Jim (March 8, 2018). "Passion, Michael W. Smith & Jekalyn Carr Debut on Christian & Gospel Charts". Billboard. Retrieved March 14, 2018. ^ Lundin, Marcus (April 8, 2018). "Michael W. Smith Launches 'Nurturing Steps,' Releases 'Lullaby' Music Album, New Book For Infants, Toddlers". breathecast.com. Retrieved May 18, 2018. ^ "Michael W. Smith to Spearhead Next Great Awakening? Singer to Fulfill Prophecy Over Nashville". Retrieved September 16, 2018. 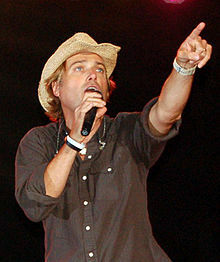 ^ "Michael W. Smith Discography, Michael W. Smith Artist Database | Jesusfreakhideout.com". www.jesusfreakhideout.com. Retrieved February 23, 2019. ^ "Michael W. Smith Coming to a Theater Near You". KFMK Spirit 105.9 FM. February 13, 2015. Retrieved February 18, 2015. ^ "Michael W. Smith Moved to Tears on FOX's The Passion Set". CBN. March 14, 2016. ^ Phan, Katherine T. (2007). "CCM Artists Lend Voices for Children". Christianity Today. Retrieved August 15, 2009. ^ "44th Annual Dove Awards". N/A. Event occurs at 1:39. Up. ^ "Michael W. Smith Leads "Just As I Am" During Rev. Billy Graham Capitol Service". March 1, 2018. Retrieved March 1, 2018. ^ "Billy Graham Honored at US Capitol Memorial Service; Trump Recalls Dad's Love for 'America's Pastor'". Retrieved March 1, 2018. ^ Black, Beau. Gloria In Excelsis Archived July 29, 2014, at the Wayback Machine, TodaysChristianMusic.com. Retrieved July 24, 2013. ^ Russ Breimeier (April 10, 2004). "The Real Dubya (interview with Michael W. Smith)". Retrieved February 12, 2008. ^ "Remarks by the President at the National Republican Senatorial Committee Annual Dinner". The White House. September 25, 2002. Retrieved February 12, 2008. ^ de Sola, David (August 30, 2004). "The politics of music: Musicians mobilize for and against President Bush". CNN. Retrieved January 8, 2018. ^ Wagner, John; Sonmez, Felicia (December 5, 2018). "George H.W. Bush funeral: Former president remembered for integrity, service". Washington Post. Retrieved December 6, 2018. ^ "Michael W. Smith, Bono team up on Christmas album". Retrieved April 3, 2017. ^ "Bono and DATA Announce The One Campaign Photos and Images – Getty Images". Retrieved April 3, 2017. ^ "Michael W. Smith". compassion.com. Retrieved May 1, 2015. ^ American, Odessa (October 5, 2013). "Michael W. Smith to bring 'Glory' to Wagner Noël". Oaoa.com. Retrieved May 1, 2015. ^ "Michael W. Smith". May 4, 1992. Retrieved October 6, 2014. ^ EndPlay (March 1, 2018). "BILLY GRAHAM HONORED: President honors Rev. Billy Graham; body lies in honor at US Capitol". WSOC. Retrieved April 24, 2018. ^ "Christian Artist Michael W. Smith Honors Billy Graham with Tearful Musical Tribute". March 2, 2018. Retrieved March 16, 2018. 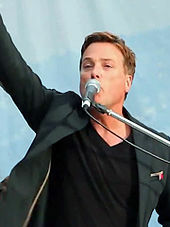 Wikimedia Commons has media related to Michael W. Smith.